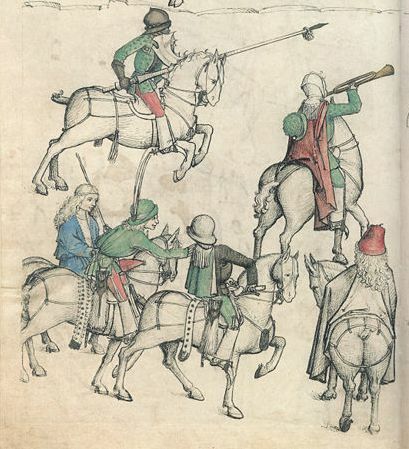 Is there any consensus on what the horsemen are wearing on their lower legs in this 1480s illustration? To me, they look like protective chaps, but the method for securing them in place isn't clear (one of the figures hint at the possibility of suspension straps hanging from something beneath the coat, perhaps the doublet or a belt, but none of the others show this feature). Might they be the heavily-exaggerated, turned-down tops of what would otherwise have been thigh-high boots instead? Or something else entirely? I believe they're in fact indeed turned-down boots. I have a picture in an Osprey book of mounted Swiss crossbowmen, and their long boots are turned down in much the same manner. If you like I could take the time to scan that and post it sometime this week. I own a pair, and they are in fact high boots with the upper part folded downward. Hmm. The turned-down boot tops sounds like a plausible explanation. I'd like some corroboration from other sources before I base an outfit on this theory, though, so does anybody have other contemporary images or texts backing this up? And any idea of whether turning down the boot-tops to this extent was a new fashion in 1480s or something that had been going on for some time by then? No theory about it. 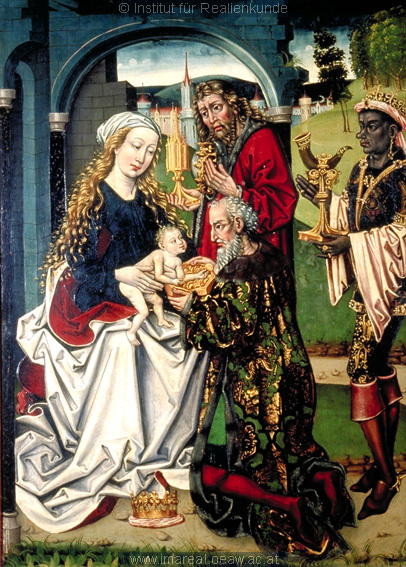 It's very well documented by art historical evidence. I don't think I've seen it prior to this period, though. Very well documented? Is there already a book/monograph/article/whatever that lays out the current state of research on this subject in great detail, then? So far I've come across a couple of other examples from the 1480s, but it's nothing systematic and I'd certainly be happy to hear if somebody else has covered this ground before in much more depth than what I've been able to achieve in my spare time. "...by art historical evidence". I don't know if anybody has written about it, but the boots are there to see in artwork of the period. Here are two examples from a slightly later period, but the same cultural context. These boots appear to be much thinner/softer, thus the need for buckled straps to support them. In the case of the rider, the boot tops are free to pile around the ankles. 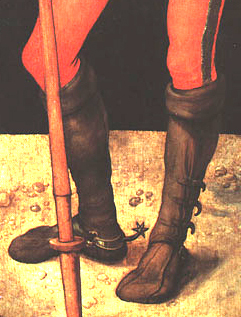 The Housebook images appear to show long braces or points running from the waist into the boot (or from the boots to the waist if points, as in the modern example above). Maybe those are attached to the knee to serve the same purpose as the later straps(?). 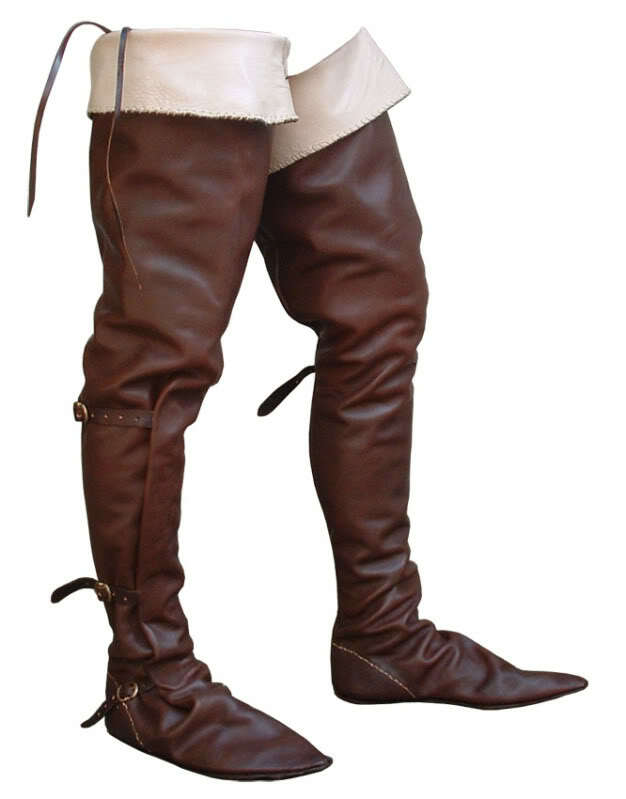 This general application--thigh-high boots with an upper portion that can be turned down stretches at least into the 17th c.
Most of those are the same images I've run across, and probably from the same sources to boot (considering the imareal tag on some of them). 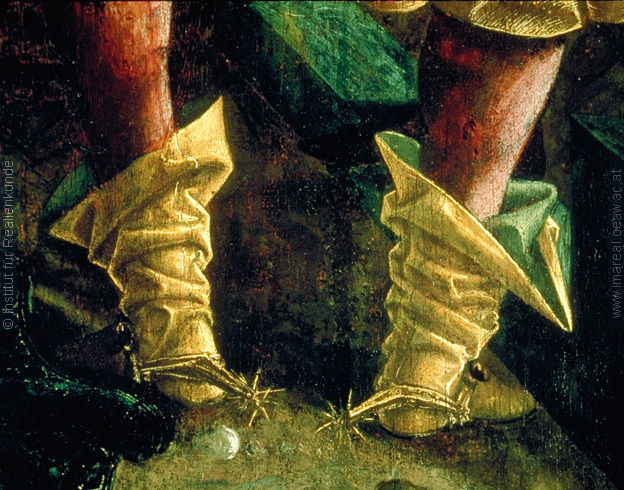 The difficulty lies in finding examples that satisfy the two conditions of 1) the boots being really high and 2) the tops being turned down all the way to the ankles, and that's why I was a bit surprised when you said that this practice is very well-documented since I thought you were referring to the extreme turn-down like in the Wolfegg Hausbuch. I think we're talking about different things, or different layers of the same question. The thigh-high, turned-down boot clearly is well documented, but you're looking for exactly what's in the house book--a turned-down boot with the turn starting at the knee and ending at the ankle. The OP wondered if these were boots or chaps, and that's the question I've been addressing. The other question is probably going to run into the problems of artistic depiction. The house book images are cruder than the examples posted above so it's difficult to judge their accuracy. All other aspects of the illustrations seem realistic, though. Exactly. When I first ran across this feature in the Hausbuch, I found it to be an interesting fashion that might be worth replicating, so I naturally wondered about the most historically plausible way to recreate it. Along the way my research (vastly aided by you and the other posters!) hasn't revealed many more examples of this exact fashion (i.e the extreme turn-down), so I'm starting to wonder if this was a rather short-lived fad, perhaps like the 15th-century equivalent of 20th-century disco fashion (particularly appropriate considering the decade!). Maybe this could turn into material for an actual article or something when I have more time (and am being less lazy than usual). 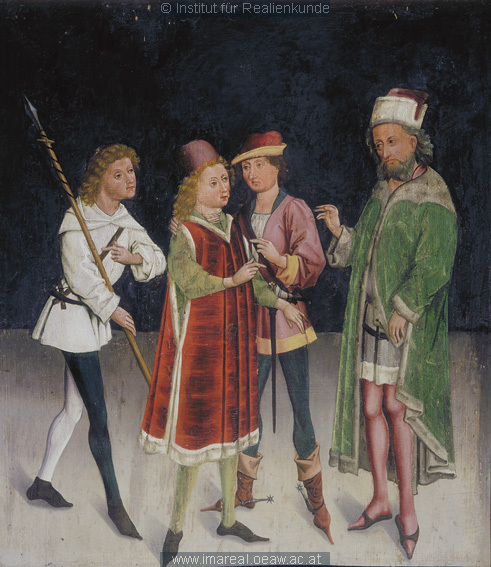 That is the Wolfegg housebook, specifically part of fol.21v, if you look at fol.22r and 21v in its entirety there are several more riders with these same boots. You can see the exact same style on fols.20v-21r. 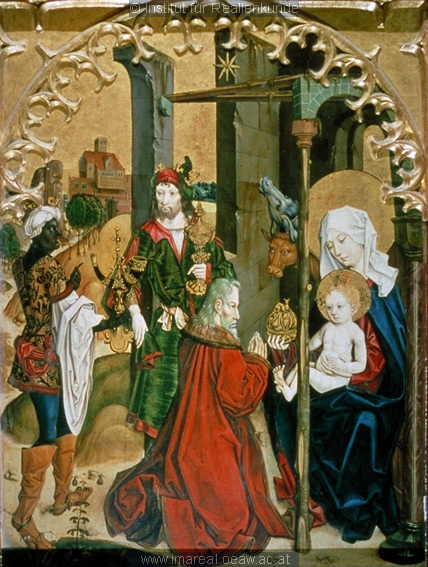 A less drastic turn down can be seen on fol.14r, "Sol and his children". 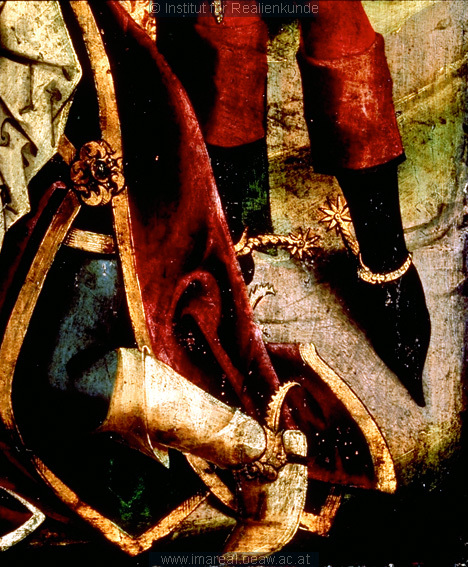 Three riders have long boots visible on fol.13r,"Mars and his children", of these one has the extremely long down turn, one ends between the bottom of the calf and the ankle, and the third ends just above the turn of the calf. Looking at them in a larger format it would be very difficult to interpret them as anything other than boots.